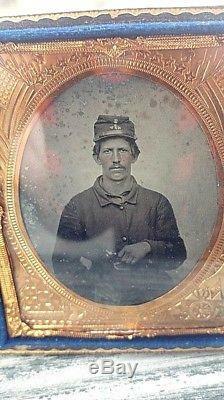 Civil War 3rd NJ Vols Co E Ruby Ambrotype 1/6th plate cased Rare NJ hat brass. 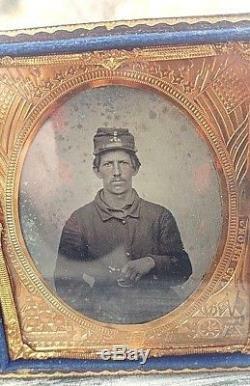 He has a killer expression and his hand is on a revolver ready to draw. Rare to see NJ hat brass, The company letter looks like an E to me. Great 100% authentic rare New Jersey image. The image is very sharp in person with good contrast. Some of my photos may show camera glare or reflections on the glass. Hat brass is 3 NJV and a small Company letter. 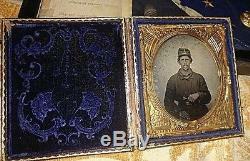 The item "Civil War 3rd NJ Vols Co E Ruby Ambrotype 1/6th plate cased Rare NJ hat brass" is in sale since Wednesday, March 14, 2018. This item is in the category "Collectibles\Photographic Images\Vintage & Antique (Pre-1940)\Ambrotypes". The seller is "squattylobe5150" and is located in Toms River, New Jersey. This item can be shipped to United States, Canada, United Kingdom, Denmark, Romania, Slovakia, Bulgaria, Czech republic, Finland, Hungary, Latvia, Lithuania, Malta, Estonia, Australia, Greece, Portugal, Cyprus, Slovenia, Japan, China, Sweden, South Korea, Indonesia, Taiwan, South africa, Thailand, Belgium, France, Hong Kong, Ireland, Netherlands, Poland, Spain, Italy, Germany, Austria, Russian federation, Israel, Mexico, New Zealand, Philippines, Singapore, Switzerland, Norway, Saudi arabia, United arab emirates, Qatar, Kuwait, Bahrain, Croatia, Malaysia, Brazil, Chile, Colombia, Costa rica, Panama, Trinidad and tobago, Guatemala, Honduras, Jamaica.